You Are Here:Home / Property Market / Farsley on the rise! The village of Farsley has undergone a transformation over the last 5 years and the popularity of the village is growing with every passing month. The investment in Farsley high street is a huge bonus for property owners in the area as both purchasers and tenants are scrambling to move into the sought after area. Cafes, restaurants, family pubs, convenience stores, a post office, hairdressers, barbers, beauty salons, a soft play centre and an art gallery can all be found on the thriving Town Street and impressively renovated Sunny Bank Mills. 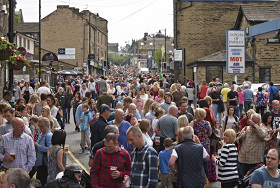 The Farsley music festival is fast becoming a legendary event with attendance growing year on year and the numbers are expected to be impressive again on Bank Holiday Monday May 25th 2015. With all this to offer it’s no wonder Farsley is becoming more and more popular with house hunters.